There isn’t much to add regarding Hurricane Sandy. Luckily the storm did not affect us much. Besides shaky windows and being stuck inside, the worst thing that happened to us was our building’s parking garage getting a foot of water. My car started up yesterday, so hopefully it works later without issue. Many people we know had flooded basements, some waist high or as much as five feet! I can’t imagine what that is like to clean up. During the storm we did not have any loss of power however, last night it went out around 9:00pm and was back on by midnight. (The reason for this post being so late). Three hours of lost power is definitely not much to complain about. By our place (in Sheepshead Bay, Brooklyn) there wasn’t much damage. 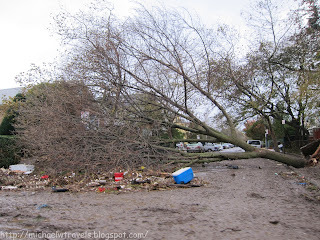 We saw lots of branches from trees on the gorund and some dirt in the streets & on sidewalks. A few blocks further, the same could not be said. I heard that trees were down, blocking streets and cars were abandoned in the middle of the street. In the main shopping area, many stores were destroyed. They were flooded or had windows blown out. I can’t imagine how long it will take to clean up this mess and rebuild these areas. I decided to tag along with my parents for a ride to check out Sheepshead Bay and Manhattan Beach. I could not believe what I saw. See for yourself with some of the pictures I took. This store on Sheepshead Bay Road had it’s windows blown out and the inside of the shop destroyed. See the turned over soda refrigerator and shelving making a huge mess. The owner of the house below told me how he had thee feet of sandbags blocking his driveway. Regardless, it took around 15 seconds for the water to rush in and flood it. The sandbags were knocked over and his garage looked like a swimming pool. He told me that luckily the first floor of his house only got about five inches of water inside. In the bay, boats were pushed around and the walkway bridge (which was recently replaced) was in pretty bad shape. Our thoughts go out to everyone affected by Hurricane Sandy. I was lucky enough to come across this awesome street sign last week. I wasn’t on vacation or even too far from home. I’ve passed this street tons of times and NEVER before noticed this sign. I was waiting in the car with my son while my wife ran in to grab a couple of donuts at a local place. I opened my window to get some air and happened to notice another dessert option- Ka Ka Bakery right next door! I immediately pulled out my phone to get some photos of this awesome and ridiculous sign! As my wife came back to the car she spotted me taking pictures and said she had also just noticed the sign for the first time. Was Ka Ka the best name they could think of for a bakery?